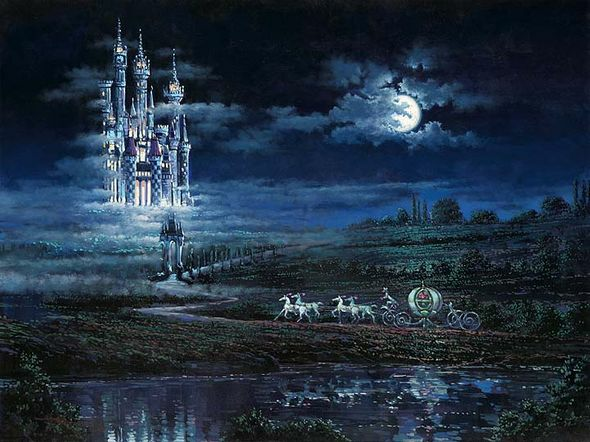 Rodel Gonzalez Handsigned and Numbered Limited Edition Embellished Canvas Giclee:"Moonlit Castle (Cinderella)"
Edition: Artist Hand Signed and Numbered Limited Edition to 195 with COA. About the Artist:Rodel Gonzalez is an artist of inspirational talents with a keen eye for seeing the beauty in the commonplace and grace in the ordinary. His story starts with an initiation into the art business through the tutelage of his father, Rick Gonzalez and grandfather, Felix Gonzalez, at the age of 9. "Growing up my father would always tells me to not be intimidated by the paint and be 100 % sure about my intentions on my first stroke at the canvas" says Rodel. His explorations of color, form, and composition ignited a lifelong passion for the arts in its many forms. He studied at the University of Santo Tomas, with a major in painting and went on to earn a degree in Interior Design from the Philippines School of Interior Design. This early training required perseverance in acquiring the skills and discipline that would prove to serve him well in future endeavors on his path to artistic freedom.